Johnny Ramone, guitarist for the Ramones, passed away in 2004 after losing a long battle with prostate cancer. 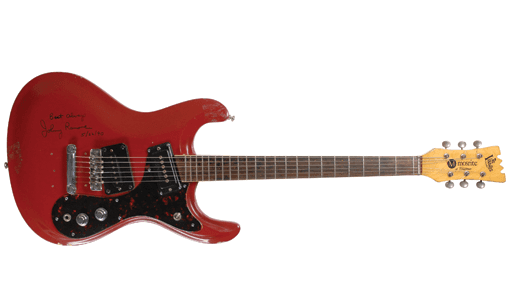 His legacy lives on in an auction where 150 items will be sold off, including his one red 1965 Mosrite Ventures V1 guitar. This guitar is specially handwritten by Ramone himself with the words “Best always, Johnny Ramone, 5/22/90″ written in permanent marker on the front. The guitar has been modified by replacing the tremolo system with a stop bar as well as a DiMarzio FS-1 bridge pickup. It also features a tortoiseshell pickguard and the guitar’s original hardshell case. Ramone sold the guitar to Gene Frawley in 1990 who was at the time the band’s driver. It was at this time when Ramone made the writings on the guitar. “This is one of just nine Mosrite guitars owned by Ramone known to exist—an exceedingly rare and historically important piece of music history,” says Bobby Livingston of RR Auction, who are responsible for auctioning the guitar. The auction takes place on January 22 at RR Auction’s Boston Gallery.